Good systems and details from the Catalina 445 work just as well in a smaller sister. 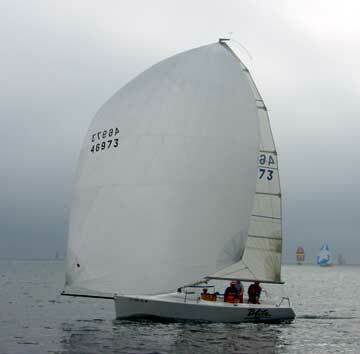 I like test sails with Gerry Douglas, Catalina Yachts’ chief engineer and designer. I always learn something new – certainly about the test boat but also about the thought that goes into naval architecture and the details that set certain production boats apart. Last year, I sailed with Gerry on the newly introduced Catalina 445 with winds gusting to 30 knots. Last week, we sailed her little sister, the Catalina 355, in much more benign conditions of 6-8 knots true. Gerry pointed out how he got a rather impressive set of innovations into a smaller package, bringing the success of the 445 to the mid-thirty foot market. 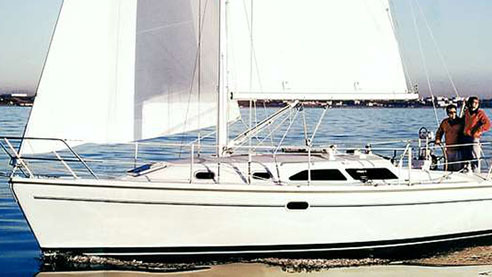 The Catalina 355 features a low cabin profile, a long waterline, and moderate freeboard. 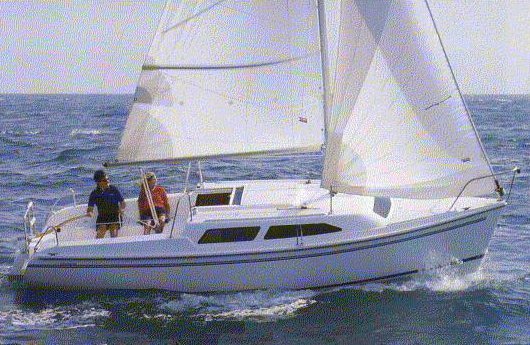 The Catalina 355 features a low cabin profile, a long waterline, a reasonable 12’ beam and moderate freeboard. 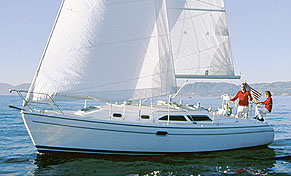 Like the 445, the 355 is a three-piece mold with a unique feature – the transom is actually part of the hull mold rather than the deck mold, which eliminates a vulnerable joint and makes the hull stronger. What is completely new in this design is the watertight StrikeZone compartment, a space below the anchor locker that is completely filled with foam. This patent-pending innovation is designed to increase safety in case of grounding or hitting a submerged object. The 355 displaces just under 15,000 pounds with a wing keel option that draws 4’ 6”. 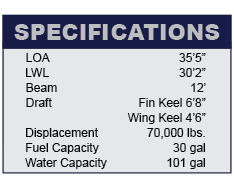 You can also choose a deep-draft fin keel that draws 6’ 8”, saving about 1,000 lbs. and probably improving your upwind performance. On a close reach, the 355 will do 6.5-6.7 knots in 14 knots of apparent breeze. We managed to eke out 4-5 knots in 8 knots true on a beam reach, which is respectable given such light conditions. Like most Catalina yachts, the 355 is sufficiently powered and the 29-hp Yanmar will push the boat at about 7 knots. The stern is part of the hull mold, which makes the hull stronger. Sail area (100% foretriangle) is 572 square feet, but the 355 can carry up to a 155% genoa, which boosts total area over 700 square feet. 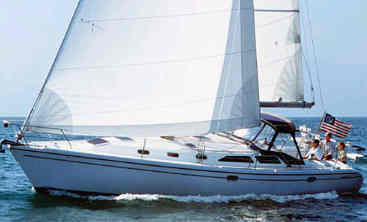 A 135% genoa is standard, as is a furling main with vertical battens. The Selden 19/20 fractional rig is deck-stepped over a compression post. 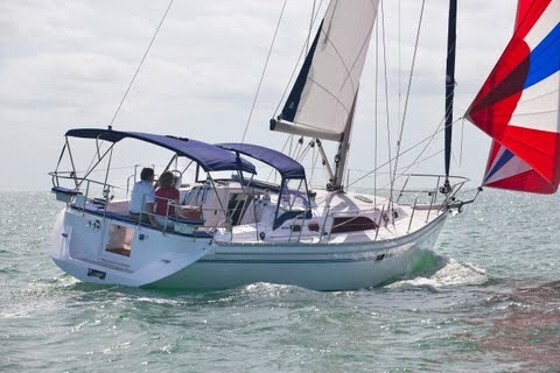 We sailed with the optional Utility Power Sail (UPS) by Doyle, which is a type of gennaker on its own roller-furler that is hoisted with the spinnaker halyard. It was a good sail to have in the light winds we experienced that day. It adds about $4,000 to the base price. The five-foot-long Garhauer traveler with single-side handling and 6:1 adjuster makes for easy control of the mainsail. Two cabintop winches control most running rigging, while the two primary winches are positioned well aft and within reach of the wheel. 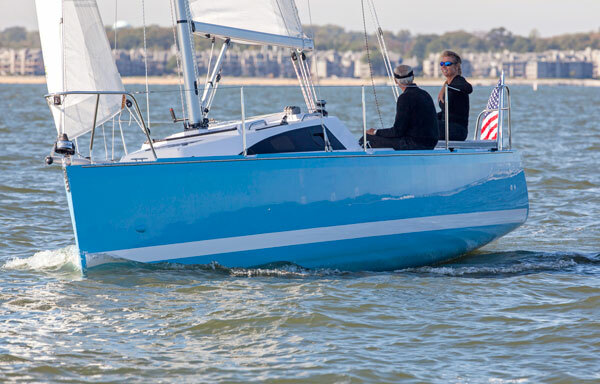 There are forward and aft lower shrouds and in-line uppers that allow for tight sheeting angles and good upwind performance. Added safety comes in the form of twin backstays that terminate independently at the masthead. This keeps the boarding area clear and a tall helmsman from ducking the backstay when moving from one side to the other. The decks are wide and clear and there are handy mid-ship cleats on both sides. Two seats to port can be converted to a straight settee. 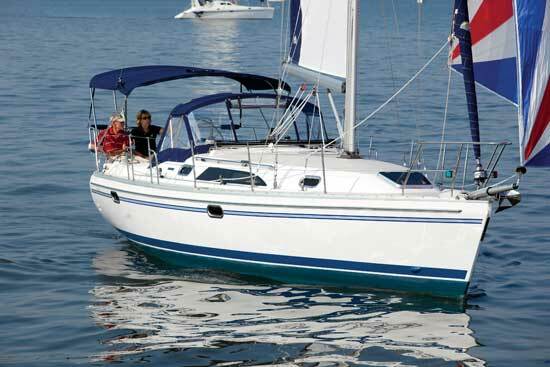 On deck, the Catalina 355 is all about performance, safety, and ease of use. A removable spinnaker bowsprit forward can be stored in the anchor locker. An aluminum toerail provides options for securing additional hardware and blocks, and the 28” stanchions are higher than on other comparably sized boats. Catalina is known for their cockpit comfort and the 355 is no disappointment. Angled benches, an insulated folding table, and stern rail seats are standard. The walk-through transom leads to an ample swim step that makes boarding easy. The aft storage locker is in addition to the very large, portside lazarette with gullwing access. Wind instruments sit below the NavPod that holds the Raymarine multifunction display. This makes the whole binnacle area lower and lets shorter folks see forward without obstacles. Also nice are the helm seats that are 8” higher than the cockpit benches and help with visibility as well. “I hate to lift cushions,” says Douglas. “That’s why I designed interior storage spaces that are accessible.” It’s true, everywhere there is storage below a seating area, there is also front or drawer access, which makes things neat when you’re looking for that last can of soda that you swear should still be aboard. The forward master cabin has an articulating mattress. Down below, the 355 took other good leads from her bigger sister. The master cabin is forward, with an island berth that has an articulating mattress with an electric lifter, so you can read or watch TV while inclined at a comfortable angle. There is plenty of storage in two cedar-lined lockers and drawers under the berth, and there is room to stand up and change even with the door closed. The saloon has 6’5” headroom and features a starboard side U-shaped settee with an optional quad-leaf folding table that accommodates a dinner party or shrinks neatly to provide more room in the cabin. Two seats with a small cocktail table to port can be converted to a straight settee with extra cushions, and this also forms the seat for the aft-facing nav station. The nav desk includes a recessed laptop compartment with power ports and a file drawer to store all manuals. The roomy head aft includes a separate stall shower. Farther aft to port is a roomy head that includes a separate stall shower and a stylish glass vessel sink – just like home. Across from the head is the L-shaped galley with a top and front loading reefer, and two deep sinks on the centerline with a splashguard. There is plenty of counter space, but like on most boats of this size, better hope for little traffic to the aft cabin when you’re cooking – the door opens right into the galley. The cabinetry is finished with a clear varnish on light teak and teak veneer surfaces, and the doors are solid wood so small scratches and dings may be sanded out. The sole is Catalina’s proprietary embossed teak and holly-like finish that doesn’t show scratches and has just enough non-skid properties to make it quite safe even when heeling. 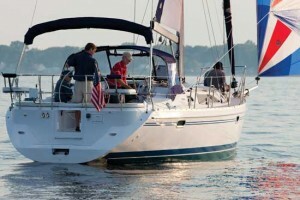 The Catalina 355 was introduced at the Annapolis boat show with a base price of $164,700. Price as tested was closer to $200,000. There is a quick-check inspection panel in the engine cover. “We pay a lot of attention to systems,” says Douglas. “I like to think we do them right.” A lot of smart things back up that statement: three rotomolded water tanks, which hold a total of 101 gallons, are sized so they can be removed by way of the companionway if need be. There is also a quick-check inspection panel in the engine cover so the whole thing doesn’t have to come off to make sure fluids and belts are okay when underway. In the head, there is a filter locker that provides easy access to the fuel and cooling water filters and valves. Two 4D batteries (450 amp hours) are standard with an optional separate Group 27 starting battery available. 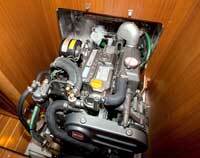 There is a secondary or high-water bilge pump in case the first pump fails. All lighting is LED-based and the optional LED TV may be set up to serve as a repeater for the Raymarine multifunction display. The electronic panel is logically laid out and grouped by function including lighting, navigation/communications and pump/systems, with spares in each category. The electronics bus is easily accessed so a laptop can be tied in for navigation. All these little things aren’t there by accident. It takes a deep understanding of how owners use their boats to pack in so many features. Douglas’ attention to detail creates a very usable boat that brings a lot of smart innovations down to the thirty-something segment of the market, where many couples and families are likely to focus in the years ahead. For more information, visit the Catalina Yachts website.